Staff and service users help clean up the neighbourhood. Part of the Bristol Clean Streets campaign, the Big Autumn Litter Blitz is an initiative by Bristol Waste, taking place from 16th – 29th October, helping to raise awareness about litter problems within local communities and encourage people to use waste and recycling bins. Built on the success of this year’s Great British Spring Clean, the Litter Blitz sees families, friends and neighbours getting together to make a difference in their local community by doing a litter pick to help spruce up their neighbourhood. 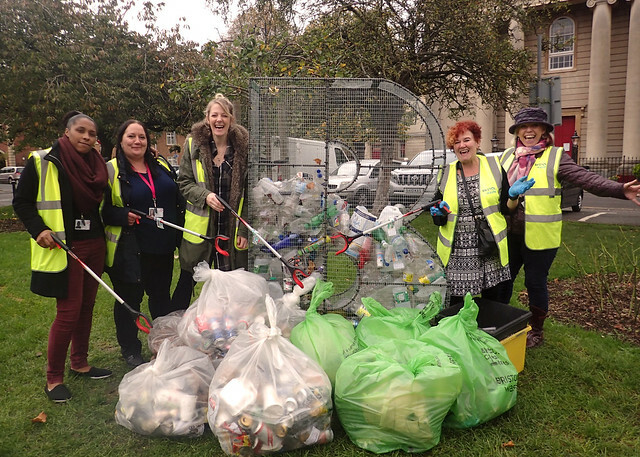 Armed with litter-pickers, waste bags and high visibility jackets, we invited our staff, service users and friends to join us for our litter pick – cleaning up Brunswick Square, Brunswick Cemetery Gardens, Surrey Street, Pembroke Street and Portland Square. We then met back up in Brunswick Square where we were hosting our Litter Letter sculpture – a big wire-framed bin in the shape of ‘B’ for Bristol (and BDP). Made by the Litterati, a Bristol-based social art collective who tackle environmental and social issues creatively, the sculpture formed part of the LuvBRISTOL campaign at this year’s Bristol Harbour Festival. We would like to say a big thank you to our staff, service users and local friends who spent their time litter-picking and sorting through the collected waste and recycling. Our neighbourhood is looking much cleaner thanks to everyone’s hard work!